9 December 2013 - Nashville, Tenn - Capitol CMG Label Group garnered seven GRAMMY nominations for the upcoming 56th Annual GRAMMY Awards. Nominations were announced by the Recording Academy on Friday evening live from Los Angeles. Chris Tomlin received two nominations as a writer and artist (Best Contemporary Christian Music Song, Best Contemporary Christian Music Album) and Mandisa was recognized with two nominations as an artist (Best Gospel/Contemporary Christian Music Performance, Best Contemporary Christian Music Album). In addition, her No. 1 song "Overcomer" was nominated as Best Contemporary Christian Music Song. Tobymac recieved a nomination as a writer (Best Contemporary Christian Music Song), and Matt Redman was recognized for Best Contemporary Christian Music Album. "We could not be more proud and excited for our artists at Capitol CMG who were nominated for a GRAMMY award," says Peter York, President, Capitol CMG Label Group. "We congratulate all of our artists and nominees for their extraordinary work, and we are grateful to the voters of The Recording Academy for acknowledging these artists." According to a press statement released by The Recording Academy, this year's GRAMMY Awards process registered more than 22,000 submissions over a 12-month eligibility period (Oct. 1, 2012 - Sept. 30, 2013). The 56th Annual GRAMMY Awards will be held Jan. 26, 2014 from the Staples Center in Los Angeles, airing on CBS at 8pm EST. ____ The complete list of nominees can be found at www.grammy.com/nominees. 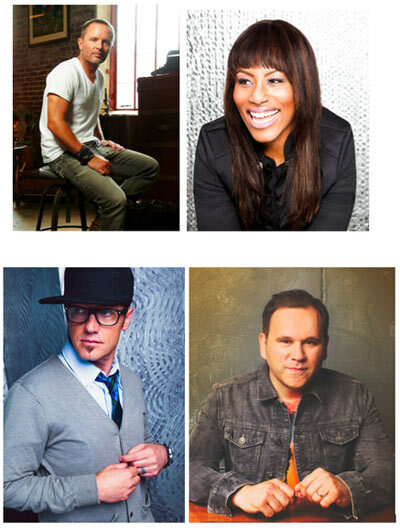 For more info on TobyMac visit the JFH Artists Database. For more info on Mandisa visit the JFH Artists Database. For more info on Matt Redman visit the JFH Artists Database. For more info on Chris Tomlin visit the JFH Artists Database.